Chinese New Year falls on January 31st. It is the year of the horse. Chinese New Year is a celebration of many customs and traditions. Chinese New Year is an important traditional Chinese holiday, celebrated on the first day of the year of the Chinese calendar. In China, it is also known as the Spring Festival. Chinese New Year celebrations traditionally run from Chinese New Years Eve, the last day of the last month of the Chinese Calendar, to the Lantern Festival on the 15th day of the first month, making the festival the longest in the Chinese calendar. Celebration of the Chinese New Year vary widely. Often the evening preceding Chinese New Years Day is when families gather for Reunion Dinner. It is also traditional for families to cleanse the house, in order to sweep away ill-fortune and to make way for good incoming luck. Windows and doors are decorated with red color paper-cuts and couplets. Other activities include lighting fire crackers and giving money in red paper envelopes. 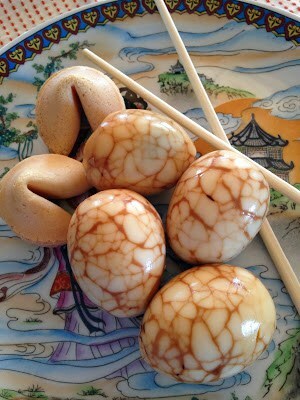 Chinese Dumpling~ Is one of the most important foods in Chinese New Year. The shape is similar to ancient gold or silver ingots and symbolize wealth. Traditionally, members of a family get together to make dumplings during New Years Eve. They may hide a coin in one of the dumplings. The person who finds the coin will likely have a good fortune in the New Year. Noodles~ Are a symbol of longevity and a long life. They are to be eaten long and uncut. Fish~ It is customary to serve a fish at the end of the evening meal. It symbolizing a wish for abundance in the coming year. Fish is served whole, head and tail attached, symbolizing a good beginning and ending for the coming year. Duck~ Peking Duck~ Ducks represent fidelity. Red ducks are featured at weddings, as red is the color of happiness, and served at New Years celebration for the same reason. Chicken~ Serving a whole chicken is popular at Chinese New Year, symbolizing a good marriage and the coming together of families. Seeds~During the Chinese New Year you will find a wide assortment of snacks, with different types of seeds in them. Seed filled treats represent bearing of many children. Tangerines and oranges are passed out freely during Chinese New Year. The words for tangerines and oranges sound like luck and wealth. Pomelos signifies abundance. Chinese Garlic~ symbolize eternity, while cone-shaped winter bamboo shoots are a symbol of wealth. Sticky Rice Cake~ New Year Cake~ Is a solid cake made with glutinous rice flour together with sugar. Sweet steamed cakes that are popular during the Chinese New Year. 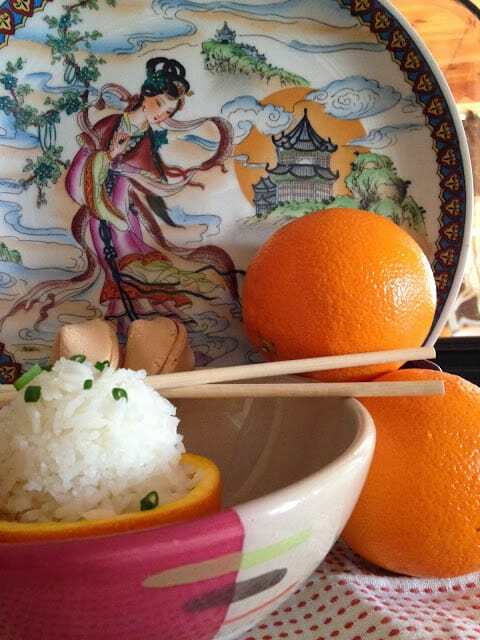 Sticky rice cakes have a symbolic significance. The sweetness symbolizes a rich, sweet life, while the layers symbolize rising abundance for the coming year. Place eggs in a saucepan with water, making sure that it’s at least 1/2 inch above eggs. Cover and bring to a rolling boil. Remove the saucepan from the stove top. Let eggs stand in hot water for 10 to 15 minutes. Remove eggs and run under cold running water to cool. Reserve water in pan. Tap the eggs gently with the back of a spoon, to make a series of cracks all over the egg shells, while making sure shell stays intact. Bring the water in the pan back to a boil. Add salt, brewed black tea, soy sauce, and spices. Add eggs. Simmer, stirring occasionally, 2 hours.Turn off heat. 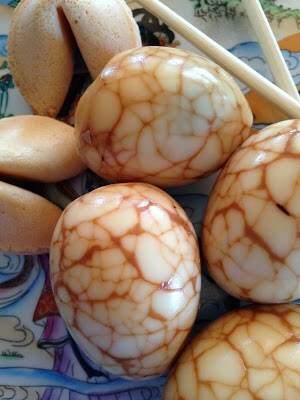 Let eggs sit in the hot liquid until ready to serve. Peel eggs and serve. Information Source: Chinese New Year. Eggs are popular in all cultures. When I was a child and went with my dad to the “Corner Bar” there was a huge jar full of pickled eggs. Here’s our version of pickled eggs. They can still be found in taverns today all over Wisconsin. Tavern Style Pickled Eggs . 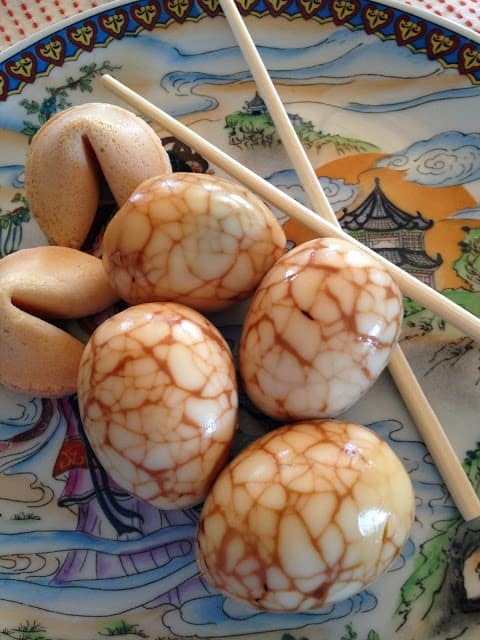 I love authentic Chinese food as one of my best friends is Chinese but I have never heard or seen tea eggs.I must ask her about them tooThanks for sharing.